An incompetent cervix, also called cervical insufficiency, occurs when the cervical tissue weakens and causes the cervix to efface and dilate too soon. This can result in premature birth, usually between 16 and 24 weeks, or miscarriage. What puts a woman at risk for cervical insufficiency? Her cervix was injured during a previous birth or dilation and curettage (D&C). She had one or more second-trimester miscarriages with no known cause. She had an incompetent cervix in a prior pregnancy. She had one or more preterm deliveries. She has a uterine abnormality. If you notice these symptoms, see your doctor right away. Is there a way to manage and/or treat an incompetent cervix? Fortunately, if your doctor diagnoses the condition, there are ways to manage and treat an incompetent cervix. Regular ultrasounds can begin at around 15 weeks to monitor the length of the cervix. Weekly progesterone shots during the second trimester may also help. A cervical cerclage, a procedure that stitches the cervix closed until the last month of pregnancy, may prevent premature birth. Your doctor should know which treatment would work best for you. 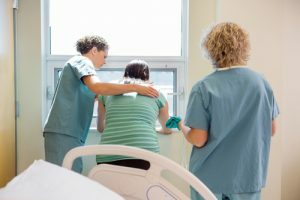 What if I deliver my baby prematurely due to cervical insufficiency? If your doctor failed to diagnose an incompetent cervix or to properly treat it, and your child suffered as a result, you may be entitled to monetary compensation from the responsible party. Thurswell Law has been representing families of birth injury victims for over 48 years. No fee unless you collect. Call us today and schedule a free consultation at (248) 354-2222.